Kirkco offers proven hot melt applicator heads for processing low, medium, and high viscosity hot melts. We have the ability to apply the adhesive in dots, beads, swirl and spray patterns. Our pneumatic or electric actuated applicator heads are characterized by their high reliability, minimal need for maintenance and modular construction. 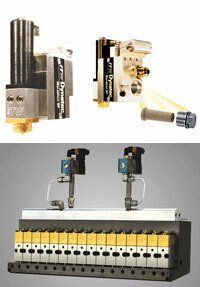 These heads consist of a heated block body, a module glue valve and a nozzle. More than 200 standard models offer numerous combination possibilities to satisfy a multitude of requirements. The modular structure means that these individual special heads are reasonable in cost. The applications these heads can handle are almost endless, especially in the packaging and graphic industries. A filter between the heated hose and applicator head guarantees safe and efficient operation without downtime. It prevents contaminants such as foreign particles or deposits of adhesive residues from reaching the nozzles. Over years of operation, deposits can form in the heated hoses. They occasionally flake off and cause blocked nozzles. Filter cartridges are particularly recommended for older systems or dusty environments.